Introduced in 1961, the BTR-60 was Russia's first truly modern armored personnel carrier. It would eventually incorporated a range of impressive features, such as a turret for protection against enemy infantry, drive train redundancy complete with two engines to make it difficult to stop, and one of the biggest troop compartments to ever grace an APC, holding 16 men! By the time construction of BTR-60's ceased in the 1980's, the BTR-60 had become one of the most common armored fighting vehicles in the world, surpassing even the Sherman tank's 50,000+ unit production run, and being second only to the M113 Gavin's 130,000+ units worldwide. This issue of Big Bang Ricochet details more than two dozen variants of the BTR-60, with stats suitable for most of them. In addition, we provide a new Turret entry for the Ukrainian BAU-23x2 Fighting Module. We also include a Big Bang entry for the 2A7 series 23mm automatic cannon, covering all three variants of the weapon, plus five types of ammunition. 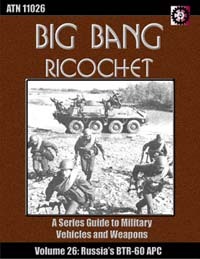 Robert VanDormolen 10 10 10 Entire Big Bang Ricochet series are concise articles packed with useful wargaming info.